Dr Patel works as a consultant physician at King’s College Hospital where he is also Clinical Lead for Respiratory medicine. He is an experienced specialist in all aspects of Respiratory medicine. This includes the investigation and management of cough (acute and chronic), asthma, COPD, Lung cancer, breathlessness of unknown cause, fibrosis, sarcoidosis, lung nodules, pleural disease, pneumonia and lung infections, bronchiectasis and sleep apnoea. Dr Patel lectures on areas of Respiratory medicine and is actively involved as a lead in undergraduate teaching at King’s College Hospital. He is a member of various professional and specialist bodies, and continues to engage in research in Respiratory medicine. 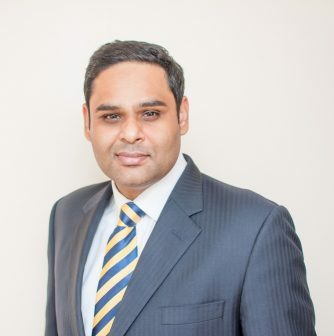 Dr Patel graduated from King’s College London and undertook postgraduate training in Respiratory and General (Internal) medicine in London at some of the country’s leading hospitals including King’s College Hospital, St Thomas’s Hospital and the Royal Brompton Hospital. During his higher specialist training he went on to study for an MD in the Division of Asthma, Allergy and Lung Biology within King’s College London. His research work is published in high impact factor international journals and he is a collaborator on projects both nationally and internationally. His work has been presented at major international symposia.